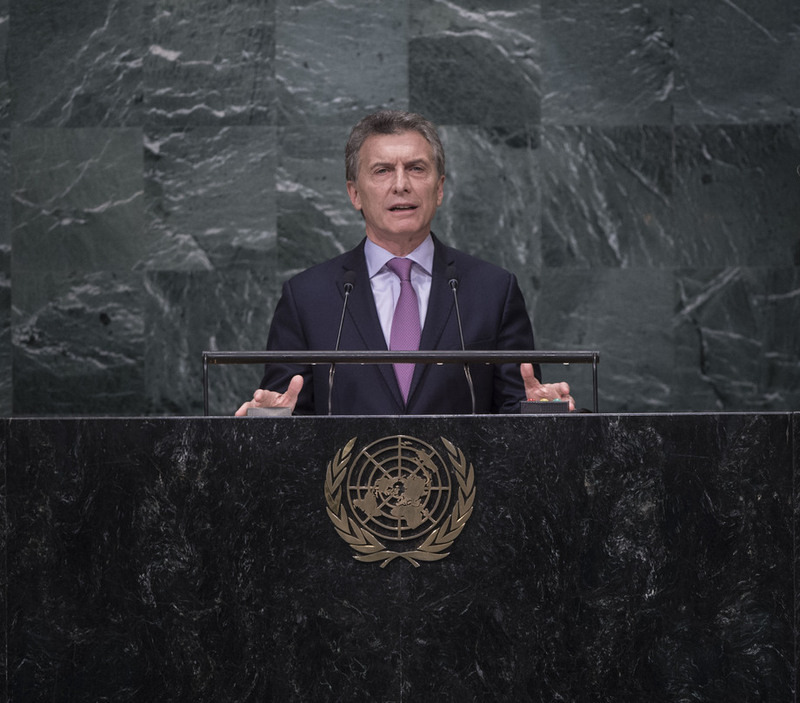 MAURICIO MACRI, President of Argentina, said the international community was undergoing large transformations and must rapidly adapt to new realities. To that end, Argentina had outlined three main goals: eradicating poverty; combating drug trafficking and violence associated with organized crime; and promoting greater unification among citizens by strengthening the country’s political leadership. While Argentina had embarked on a new path to reinforcing both its economy and its relationship with neighbouring countries, as well as multilateral institutions, it was evident that it could not achieve any of those goals on its own alone. While Argentina must seek help from its neighbours, the dire economic situation in Latin America was a harsh reality, he said. Global trade had declined, punishing those who had the least. However, there had been progress in the Latin America and Caribbean region. Important strides had been taken, including the normalization of relations between Cuba and the United States, and the peace agreement between the Government of Colombia and the Revolutionary Armed Forces of Colombia–People’s Army. Additionally, the establishment of a peace corridor in the region would further contribute to prosperity and security. The challenges facing the global community were “not exclusive to countries or regions”, he stressed, adding that “we must think globally and act locally”. Climate change was the largest challenge facing humankind. Argentina had focused its energy production heavily on solar, wind and biomass generation, in addition to having been one of the first countries to ratifying the Paris Agreement. Other critical challenges facing the international community were the refugee crisis and global terrorism, he noted. Argentina was committed to receiving more refugees from Syria and neighbouring countries, and to supporting their integration into Argentinian society, he said. “There is a part of the world in every corner of my country,” he pointed out. While the world was trending towards greater fragmentation, the global community must work together to rebuild networks and lay bridges. As a country that had itself experienced terrorism in 1992 and 1994, Argentina asked the international community for assistance in bringing clarity to those past events. The rise of global terrorism proved the need to promote development both inside and outside national boundaries, he said, adding that “development does not end at the border”.